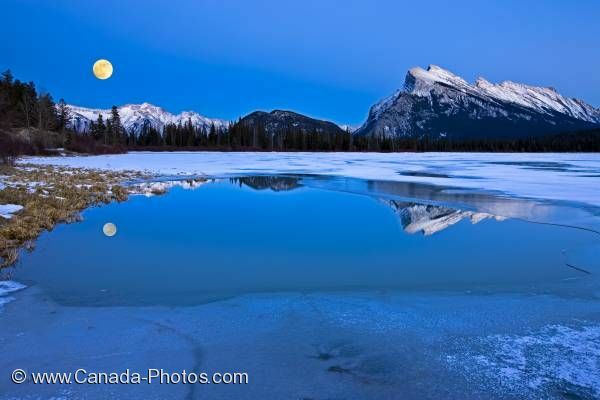 Situated near the town of Banff, 2nd Vermilion Lake is partially frozen during the winter months but still provides enough open space for a reflection of the wonderful winter scenery and full moon at dusk. Snow covered Mount Rundle (2949 metres/9675 feet) and Tunnel Mountain (1692 metre/5551 feet) with reflections on a partially frozen 2nd Vermilion Lake with full moon over the snow capped Fairholme Range at dusk during winter near the town of Banff in Banff National Park, Canadian Rocky Mountains, Alberta, Canada. Banff National Park forms part of the Canadian Rocky Mountain Parks UNESCO World Heritage Site. Please let me show you more of my pictures from my "photo gallery: Alberta Nature Pictures". Pictures from photo gallery "Alberta Nature Pictures"